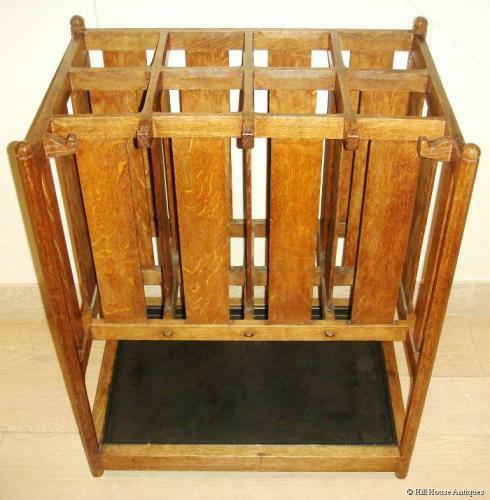 Rare Cotswold School oak umbrella or stick stand of stylishly unusual form by the top craftsman, Peter Waals (who used to be Ernest Gimson`s foreman before setting up on his own after Gimson`s death). Framework made of small sections of oak with chamfered edges around thin vertical panels. Shaped tenons at the end; c1930. A slightly larger version of this is in the Arts & Crafts Collection at Cheltenham Art Gallery & Museum and is illustrated in "Good Citizen`s Furniture" by Annette Carruthers & Mary Greensted p118 exh 57. With it`s original (now repainted) wrought steel tray probably made by Alfred Bucknall. Approx 29.5" high, 24" wide, 16.5" deep.